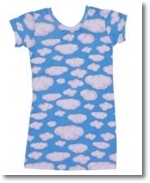 Buying a girls nightgown or any kind of girls sleepwear can be a challenging shopping experience for any parent. There are several things to keep in mind about which nightgown is best for your daughter. The first thing to consider is style, because after all if she doesn't like it she won't wear it, and this can be a major headache when bedtime rolls around. Are there any popular characters that your daughter enjoys, like Mickey Mouse, Bugs Bunny or Powderpuff Girls? Which colors does your daughter like? Kids grow quickly, so it's important to ask yourself how quickly she'll grow out of the nightgown? If you are like most parents, you can't help but notice that your daughter has favorite cultural icons. Some girls are enthusiastic fans of Barbie dolls, whereas others are more likely to tune into a favorite cartoon, such as the Smurfs. Others can be huge fans of particular young actors in children’s movies like “High school musical”. 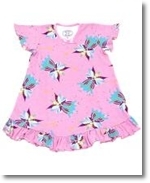 Keep this in mind when shopping for a girls nightgown, as you will find that most nightgowns marketed to young girls are patterned with the the latest pop culture icons of the day. Picking out the right girls nightgown color is a must if you want to make her happy. As with popular cultural icons, it's important for you to do some research and check with your daughter before ever going near a store. Girls frequently go through phases where a certain color or colors are their favorites, with pink, purple and blue often at the top of the list. It's a lucky parent who has a daughter that keeps the same favorite color throughout her childhood! This will give you some much needed guidance when shopping because many nightgowns have the same popular cultural icon on them, but they often come in different colors. 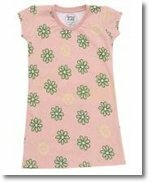 Young girls nightgowns come in a variety of fabrics. So, before you head off on your shopping adventure for your daughter’s nightgown take note of what kinds of fabrics she wears again and again, and which ones she likes best. Keep in mind that children can be very picky when it comes to sleepwear fabrics, especially man-made fabrics which can be itchy or scratchy. 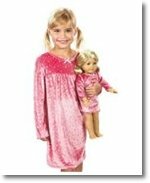 Your daughter may be one of the girls that simply doesn't like the feel of polyester or nylon nightgowns. If that is the case, opt for natural cotton nightgowns or even cotton blends that are softer and comfortable to sleep in. Cotton sleepwear is the hands-on favorite for little ones. Also, just as important but sometimes overlooked when it comes to buying a girls nightgown is to make sure that it is made of fire safe material. You can usually find out if the nightgown you are about to buy is fire safe by checking out the label. Take a pass on any nightgown or kids sleepwear (including girls robes ) that do not provide this important information on the label. Finally, you should consider how quickly your daughter is growing. Is she going through a growth spurt? You don’t want to buy a nightgown that is a perfect fit for her today if she is likely to have another growth spurt tomorrow. Also, keep in mind that some fabrics, such as 100% cotton may shrink when you wash them. To play it safe, opt for night gowns that are a size or two (depending on the style) larger. Why? Your daughter will be able to wear her nightgown longer and you'll be able to save some money. Buying a girls nightie doesn't have to be as difficult as you may think. Just remember the points discussed above, or jot them down before shopping. Be sure to know what popular characters or cultural icons she loves, the favorite fabric type, her current favorite color, and most importantly, how quickly she is growing.